Why Does My Gold Ring Turn My Finger Black? Have you ever had a gold ring that after wearing it for a while, your finger turned black or green? Did you think the reason was bad manufacturing or under karating? Well, that�s not the problem. I�m going to discuss what the causes can be and how you can prevent this from happening. The most common reason your finger gets discolored when wearing a gold ring is �metallic abrasion�. This is caused by makeup, or other cosmetics, on the skin. Cosmetics contain compounds that are harder than the gold (remember gold is soft). So the makeup will rub off very tiny particles of the metal. Very small particles of metal appear black in color rather than metallic, so it looks like black dust. When this dust comes in contact with surfaces that are absorbent, such as your skin or clothing, this dust sticks and forms a black smudge. Another reason that that your finger may discolor is corrosion of the metals in your ring. The gold does not corrode, but the alloys that are mixed with the gold. (Remember, 14K gold means the ring has 58% of pure gold and 42% of non gold alloys.) The alloys that can corrode are silver and copper based, and they can form dark chemical compounds under moist conditions. When you sweat, fats and fatty acids are released which can cause corrosion on your gold ring. This problem is worse in semi tropical locations (like when you go on vacation to Hawaii) and near the ocean where salt is in the air. A third reason is chlorine in your pool or spa. Chlorine will eat away at gold and the alloys. So if you are wearing your rings in the spa or pool corrosion is happening. Metal abrasion - Try switching cosmetics and see if the problem goes away. Remove your rings and jewelry while applying cosmetics. Then wash your hands to remove any makeup residue before you put on your jewelry. Corrosion of metals - If you are in an area that is causing you to sweat, remove your jewelry often and use an absorbent powder (make sure it does NOT have abrasives in it) on your fingers or any part of the skin that has jewelry on it. Remove rings before using soap, cleaning compounds and detergents. Clean your rings often. If the situation still has not improved consider switching to a higher karat gold, such 18K. 18K gold is 75% pure with 25% comprised of alloys, while 14K has 42% alloys. Less alloy in your ring will help with the corrosion. Or go with platinum. 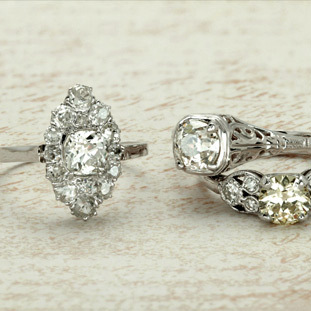 Discoloration will probably never happen with a platinum ring. 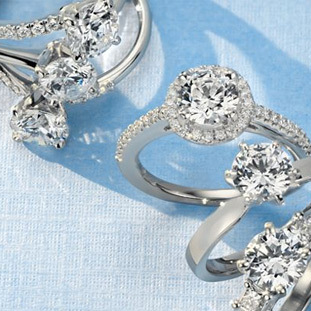 Get your ring rhodium plated on the inside. This will work. The cost will run you about $30 - $50. But it won�t last forever. It does wear off from friction and will need to be replated over time. Lastly, some people will apply a coating to the inside of the ring such as nail polish. This acts as a barrier between the metal of the ring and your skin. If you have any questions, please shoot me an email. I would love to hear from you!